© 1998-2016 Paul Mallinson. All rights reserved. Or: why Artsmagic really *do* deserve the name "Fartsmagic"
As a UK-dwelling film fan I often feel neglected by the domestic DVD market. Few distributors over here seem to really care about the titles they put out onto the market – packaging design is often poor (look at Vipco’s range of awful sleeves); print and sound quality is often neglected; and a real lack of love and care seems to be prevalent in presenting these films to the UK public. Compared to the region one market – our stuff seems positively amateurish in comparison. Take UK-based Artsmagic as an example. For years this company has seen fit to take a number of Japanese cinema classics and slaughter them on DVD, much to the horror of fans and collectors. In fact, Artsmagic are so derided among the film fan community that their titles are often referred to as “Fartsmagic” releases. "Artsmagic are so derided among the film fan community that their titles are often referred to as “Fartsmagic” releases." A number of years ago I made the mistake of buying three of Artsmagic’s “Lone Wolf and Cub” titles, only to be vastly disappointed with the shoddy transfers, sparse subtitles and amateurish packaging design. At the time (seven years ago) these DVDs were new and cost something like £17.99 each – a ridiculous amount for such poor quality product. I felt so ripped-off that I decided never to buy another Artsmagic title again – a promise I kept to myself until recently, when I once again found myself victim of Artmagic incompetence. So then I went to Amazon.co.uk and saw the single-disc R2 edition, plus the four-disc boxed set – both attributed to Eastern Cult Cinema. At this point I should maybe have done a bit more research into the label, or the supposed “mis-labelling”, but I didn’t – I bought the boxed set, on the advice of Wikipedia. And it cost £19.23 including postage and packing. When the set arrived a few days later I opened it up and was stunned to discover it was an Artsmagic release (what happened to Eastern Cult Cinema? Oh, I get it...) but that was nothing compared to the disappointment I experienced when I actually put the “Zatoichi’s Pilrimage” disc into the player. Yes: you guessed it... 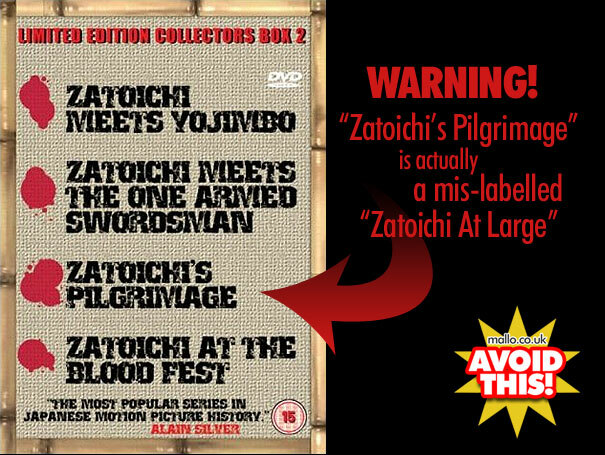 It wasn’t “Zatoichi’s Pilrimage” at all – it was “Zatoichi At Large”, completely the wrong film. And a particularly blurry and nasty green/yellow example of it too. Had I spent twenty of my hard-earned Pounds chasing a mislabelled disc put out by a bunch of retards? I had. Had Wikipedia gotten it wrong about the mislabelling? It had. Had Amazon gotten it wrong with their labelling? They had. Did I have mud on my face? I did. The lessons to be learned here are: One – a lot of what is written on the web is false; uniformed conjecture, with conclusions often drawn from supposition, rather than concrete research (ie. don’t believe everything you read on Wikipedia). And: Two – you should never, EVER trust an Artsmagic release. And if you think I’m being harsh on Artsmagic – I haven’t even started yet. Let me fully list-out my grievances with this joke of a company in the hope that no one else falls for the rubbish they put out. 1. Box art – whoever designs the Artsmagic packaging is basically a design retard with a host of cheesy flourishes up his sleeve. 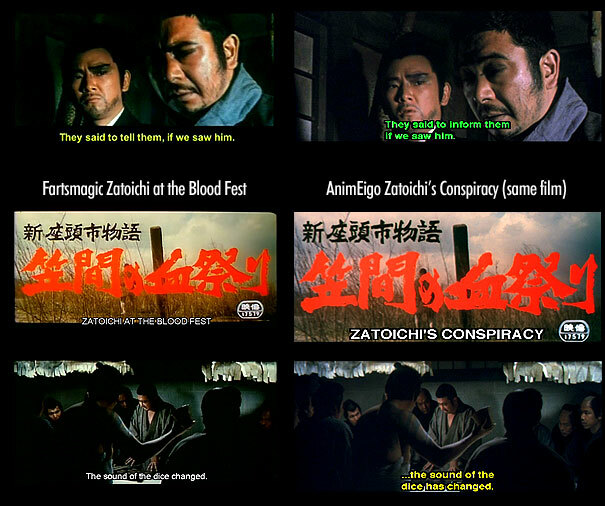 The decision to use the same basic design across each Zatoichi box front is a poor one, and the quality of the images used, their cut-out quality, and contrast balance is abysmal. Even worse – the typography is completely amateurish and the layout of the back of each title looks like it was designed by an eight year-old child in the age of cut-and-paste. It’s like Desktop Publishing never happened... I have a theory about this one (being a designer myself). Whoever designs the Artsmagic packaging is either a relative of someone high up there, or is so cheap that the skinflints at Artsmagic can’t say no. Either way: they have certainly not been employed for their design prowess – the Artsmagic Zatoichi packaging designs are among the worst I’ve ever seen and – compared to HVE’s superb packaging – they are nothing short of pathetic. 2. DVD Menus – AWFUL! Whoever thought it was a good idea to have two cut-out Zatoichi eyes playing scenes from the film at the top of the main menu deserves lobotomizing. It’s one of the cheesiest, most horrible, downright disrespectful designs I’ve ever seen on a DVD menu and whoever let it happen should be ashamed of themselves. Overall: the quality of the menu designs across the entire set is low grade. "Artsmagic have a reputation for never having released a decent transfer in their entire sorry history, and these titles cement that fact." 4. 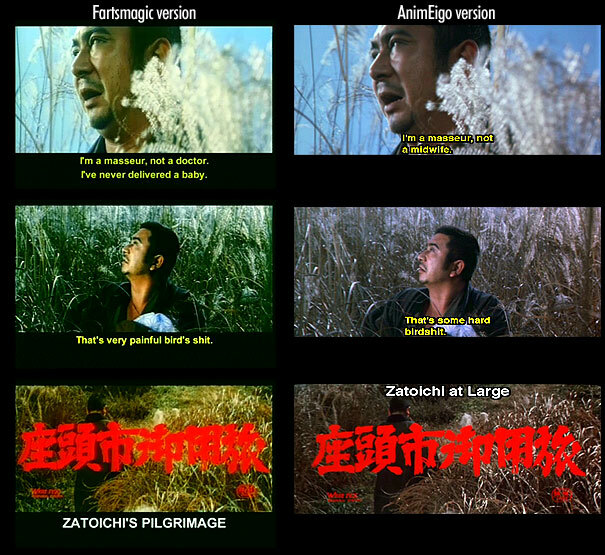 Print quality – the mis-labelled “Zatoichi At Large” (the one that should have been “Zatoichi’s Pilgrimage”) is a good example of a bad transfer. Not only is it blurry and overly contrasted, but the colours are over-saturated with yellow and green so everything looks jaundiced and wrong. 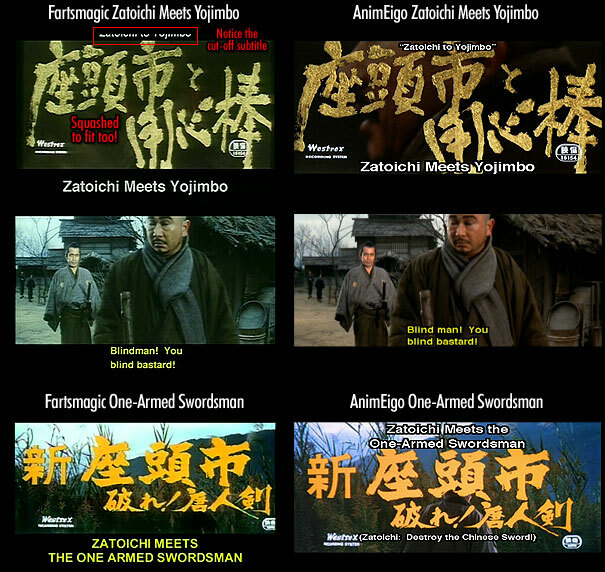 The other three titles in the Artsmagic Zatoichi boxed set (“Zatoichi Meets The One-Armed Swordsman”, “Zatoichi at the Blood Fest” (aka “Zatoichi’s Conspiracy”, and “Zatoichi Meets Yojimbo”), while not quite as bad as “Zatoichi At Large” in the colour department, all look like they’ve been mastered from tape, and are extremely poor in comparison to AnimEigo’s releases. Artsmagic have a reputation for never having released a decent transfer in their entire sorry history, and these titles cement that fact. 5. Sound quality – probably the only area I can’t grumble massively about. Not that it’s anything special; simply adequate in most of the four titles. "Zatoichi Meets the One-Armed Swordsman’s" sound seems quite blown-out in places though. 6. Aspect ratio and cropping – unsurprisingly Artsmagic think nothing of cropping a significant proportion of the frame off their transfers. How could we expect anything less from them?! These films were shot at 2.35:1 - the widest of widescreens - but you will see less of the frame in an Artsmagic release, than - say - an AnimEigo or HVE release of the same title. 7. Mis-labelling – so finally we come back to the simple fact that Artsmagic couldn’t even get their Zatoichis right when they assembled this box set. The idiots. How on earth a project like this reached the market with such a howling mistake is beyond me... Where were the checks? Did no one at Artsmagic notice they were looking at the WRONG FILM during the entire time it took to put this box set together? How many people have they duped with their "mistake"? How many people have wasted their money buying what they thought was “Zatoichi’s Pilrimage” only to find out it was a movie they already owned? The final step in this story is for me to now go through the hassle of trying to get my money back for this crappy box set. It’s not the retailer who sold it me’s fault; and it’s not my fault either – but it’s us dealing with the consequences of Artsmagic’s stupid mistake... Pity really that these great films are treated so badly by a distributor. If you want to see Zatoichi at his best - don't buy Artsmagic DVDs (or "Warrior" or "Eastern Cult Cinema" - or whatever sub-label these amateurs want to hide behind). Save your money and buy the AnimEigo and Home Vision Entertainment region one titles instead; they are a damn sight better than Fartsmagic's efforts. In conclusion: buy the region one DVDs - not Artsmagic! [Left] The mis-labelled DVD in this set. You might think you're buying "Zatoichi's Pilgrimage" (1966) but what you're actually getting is "Zatoichi At Large" (1974). So don't buy it! All the region one AnimEigo and HVE Zatoichi DVD are available to buy on Amazon Marketplace. Click here for more.